The common good thing about russian contests is that they all last no longer than 24 hours in case of Russian DX, while RAEM is 8 hours long only. Another common good thing is that THEY ALL ARE FUN, FUN, FUN! Join us and we will share this fun with you. Third good thing is that no one will ever make you pay for viewing the results, neither directly nor undirectly... unlike of... you know... and you don't have to buy other country's amateur organization membership to see expanded results to make corrections in your contest strategy... unlike of... you know.... Everything is on the Web. Definitely the number-one russian contest. Very high rates all 24 hours, I bet you're gonna like it. Outstanding Web-page with the bunch of results, stats, UBNs, participant's Russian Awards credits, soapbox, archives, pictures, and other contest-related info. Contest period: 12.00 Saturday - 12.00 UTC Sunday, 3rd full weekend of March. 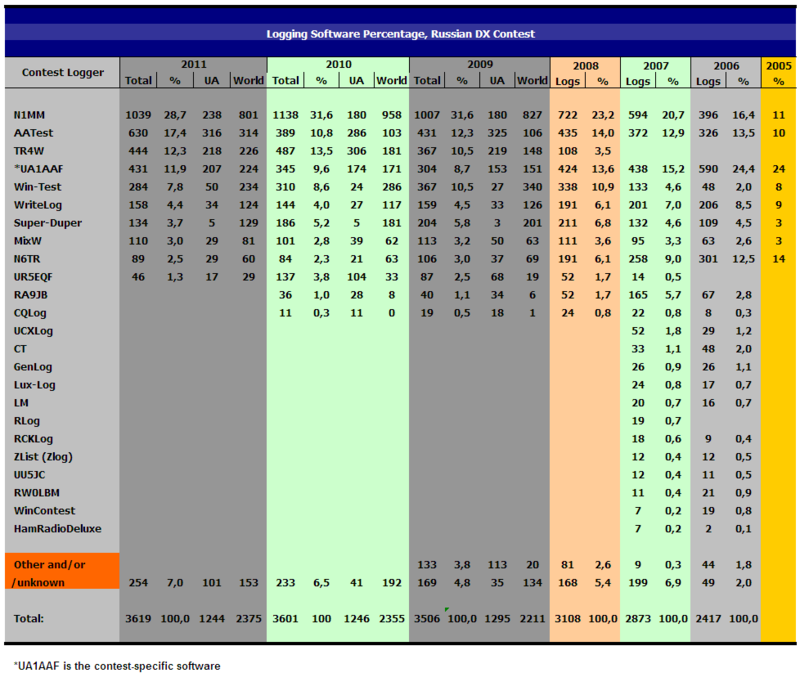 See the diagram with RDXC 2005-2008 Logging Software Percentage. CW and/or SSB, everyone can work everyone, 24 hours, mults - russian oblasts + DXCC Entities. CQ WWDX 2008, CW - 5170, SSB - 4880 logs (as of Jan 31 2009). Contest Period: 14.00 UTC Saturday - 08.00 UTC Sunday, 3rd full weekend of August. CW and/or SSB, foreign stations can work russian stations only; russian districts as mults. Number of received logs: 2003 - 469, 2004 - 848, 2006 - 905, 2007 - 1087, 2008 - 1205 logs. Note for N1MM Logger users: if you wish Russian stations exchange (RDA number) prefilled, download and install "call-history" file. Unzip and see "Readme.txt" for installation instructions. A rookie in the list. But, what is good about RTTY contests, there are always hundreds of participants on that narrow portion of the band. Like the RDXC, mults are Russian oblasts and DXCC Entities. This contest is sentenced to be a successful one. Contest Period: 00.00 – 24.00 UTC, 1st Saturday of September. 24 hours, everyone can work everyone; mults: Russian oblasts and DXCC Entities. 319 logs in 2004. This was the first time contest was held after long time stagnancy. Another old good one with traditions coming deep from Soviet era. Unique exchange numbers consisting of serial number AND geographical coordinates (599 001 51N55O, for example), make this contest real challenge, and make it very popular among real contesters in ex-USSR. Points calculation depends on difference in coordinates (see rules), every QSO with RAEM memorial station is worth 300 additional points, every QSO with a Polar Circle station is worth 100 additional points. Contest period: 0200 - 0959 UTC Sunday, 4th full weekend of December. CW only, everyone can work everyone. Note for N1MM Logger users: if you wish contest exchange (coordinates) prefilled, download and install "call-history" file. Unzip and see "Readme.txt" for installation instructions. N1MM Logger call-history files for RAEM, RDA, Russian Cups and some other contests.